Unless you went to a less than academically stellar middle or high school you probably had teachers and administrators encouraging or downright requiring you to read over the summertime. My school didn’t, so I lucked out, I guess? Maybe they didn’t care about the summer slide, but I was just happy to read what I wanted. But many students have a prescribed list decided upon by committee, secret coven, or last minute panic. Often students have to do an assignment over the summer or at the beginning of school based on the book to show that they completed the reading. It sometimes works that students read the books, and of course, sometimes students just don’t. 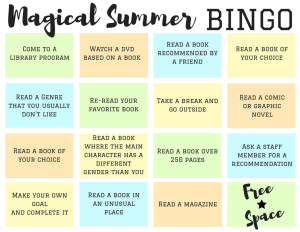 My library’s Magical Summer BINGO board! (Image by MHL Teenroom). Schools do their lists in all different ways. Some have students read classics or popular titles. Maybe they change every year or the list stagnates for a while so older siblings tell the younger ones the horror stories of having to read something crazy boring over the summer. I’ve seen a number of different approaches in the handful of schools I’ve worked with. One school district made a list of about 15 to 20 books per grade and allowed students to choose from the list. This is a good idea in some ways, because it gives students more choices, but it was a collection development nightmare for me. That many titles is a lot to try and have multiple copies available. Summer reading books have a way of getting checked out all summer and sheepishly returned in September or never returning at all, so keeping all those titles stocked was hard. Two years ago, the public school in the town where I work had all the high schoolers read one book. That was certainly an easy book buying day for me, but that can be a struggle to find a book that works for so many different grades and reading levels. But the best summer reading list, in my opinion—and there are a few schools who do this—is to have no list at all. Students may be encouraged or even required to read a book or two over the summer, but they get something that I think is a key part of combating the summer slide: Choice. Yes, it’s super important for students to read over the summer, especially if they are not inclined to read in the first place, but I think that requiring students to read books that they don’t want to read can do more harm than good. I hear you about to start grumbling and saying that of course students should be required to read things that they don’t want to read. I had to read A Separate Peace and I hated it, so they should, too! Sometimes you have to do things you don’t want to do in order to learn! Of course this is true. Books will be required and part of being a student is learning how to complete work that isn’t fun or interesting or easy. It’s good training for the rest of life where you have to do things you don’t like all the time. But if the main goal of summer reading is to prevent the summer slide, and I hope, to create students who like to read for pleasure, shouldn’t students be encouraged to just read, period? Read the cereal box, read the Macy’s ad, read a Tumblr fan theory, read a comic, read a novel, or read whatever! I wish that schools encouraged students to read what they enjoyed and put less of an emphasis on reading as a means to an end, at least for the summer. Let reading in order to gain knowledge about a topic or even with express intent to build critical thinking skills take a little break over the summer. I may get chided for saying this, but I believe students need a break and need to be able to read what they want. Plus, if a student really enjoys a book or comic or whatever they are reading, they may seek out more like it or text their friend to talk about the twist at the end. That means they are engaging with the literature, and isn’t that what we want? On a related subject, psychologists are recognizing that boredom that can be really good for kids. Boredom can allow kids to figure out what they actually like doing and then enable them the space to pursue those passions. Just like not having a prescribed summer reading list can give kids freedom to choose what they actually want to do, boredom forces kids to use their imaginations and rely on their own brains for entertainment. What am I saying? Let your kids read whatever they want and be bored this summer. Trust me, I’m a professional. So, I had originally thought of making a “YA? Y Not?” Summer reading list for this column, but by now I’ve basically talked myself out of it. How could I recommend titles to you after my screed against assigned lists? I couldn’t! But I can recommend books in another way. At my library our summer reading program won’t be tracking books or amount of time reading, but rather by a Bingo board of categories. It’s not a new idea, and we’ve been inspired by the Seattle Public Library and others like Book Riot’s Read Harder Challenge. In the teen room, if you complete a row, or make a Bingo, you get a prize. Fill out the whole board and be entered to win a grand prize. 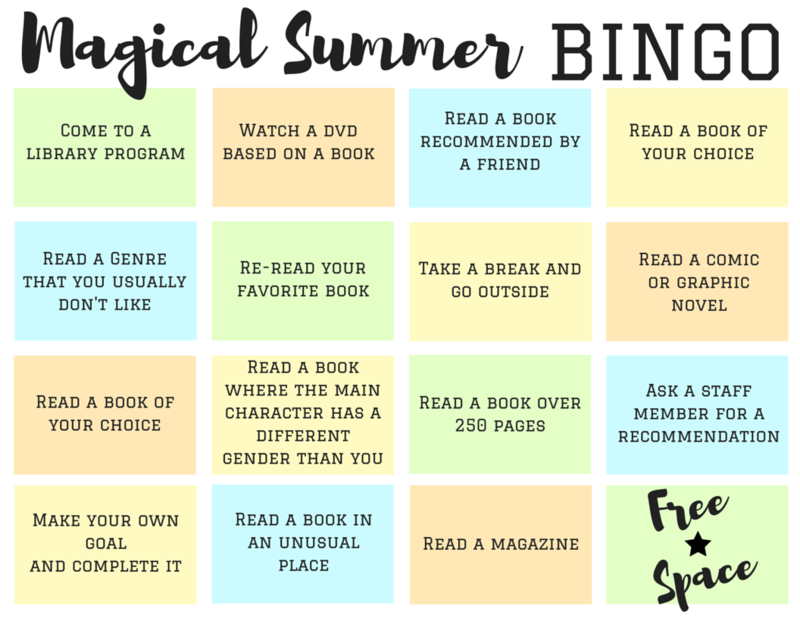 In light of our Bingo board, here are some YA suggestions for you this summer. I hope you find something you enjoy, that challenges you, or just plain makes you happy. Read a YA book . . .
…in a genre that you don’t usually like (mine would be romance!). …by an author of color. …where the main character is a different gender than you. …that’s a coming of age story. …that’s a coming out story. …set in a culture different from your own. …that has a terrible cover, but could be secretly good. …that you read as a teenager to see if it still holds up. …recommended to you by a friend. …that you want to read! Let me know what choose. I’m always looking for a secretly awesome book with a heinous, embarrassing cover!